Campsite De La Crau is a campsite with 35 touring pitches. During low season, between 31-03-2019 - 06-07-2019 and 25-08-2019 - 30-09-2019, the nightly rate is €18,- at one of the 35 touring pitches at Campsite De La Crau in Saint-Martin-de-Crau (Bouches-du-Rhône). At this campsite you can not only use your CampingCard ACSI for inexpensive camping, you can also use your ACSI Club ID (as an alternative ID). 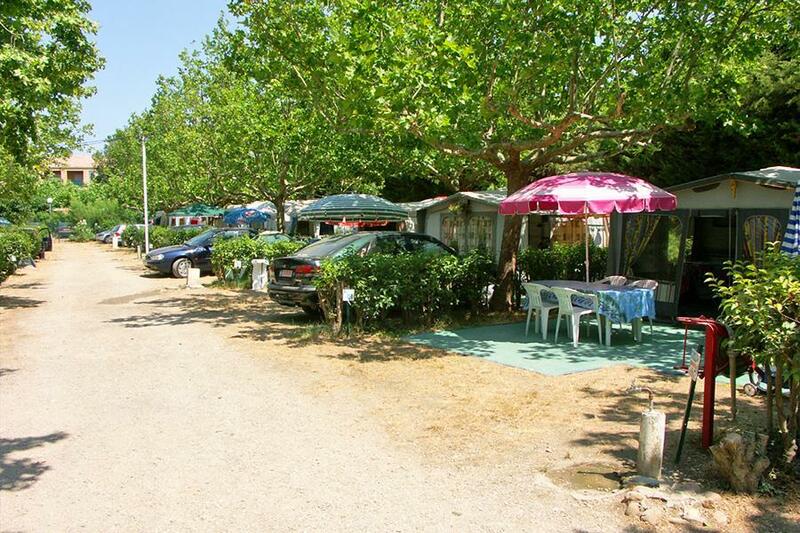 A natural campsite located behind a hotel-café-restaurant in the centre of a Provençe village. An ideal starting point for visiting towns in Provence, such as Les Beaux, St. Rémy and Arles, as well as the Camargue, Avignon and Nîmes. Great for cycling. Easy access for large caravans, pitches vary in size. We has a large pitch next to the swimming pool which was being serviced ready for the season. In town with plenty of restaurants. Toilet block very good, clean, showers exceptional, plenty of pressure with plenty of hot water. Down side - wifi, could get next to pool most of the time, told that there were problems with wifi this week. Looks like an ongoing problem. Owner, extremely helpful and friendly. Visited Arles, well worth a visit. Lovely private flat pitches. good sized toilet block and cubicles, but water for washing dishes was only tepid. Pool looked open, but didn't use it as it was full of leaves. Staff were very low key. A 2 min walk into the small town with a good tourist information office with cycling route suggestions. We cycled into Arles one day and down to the Camargue, crossing the Rhone on a (free for cyclists) ferry another day. Train station just outside town, but with infrequent trains stopping. Need mosi-spray and candles on this site and in around area. Stayed here in our motorhome for three nights. Reception is hardly ever open, so the point of contact is the restaurant where the owner speaks good English. Some pitches are not accessible due to overhanging branches. Our pitch was large and level. Showers were adequate, but water for washing up and laundry was only luke warm. The location was perfect for visiting the lovely town of St Martin de Crau. There is a huge market on Fridays selling lots of local produce.Perfect site for visiting Arles & St Remy and the Provence area. Stayed for one night in May, rather than the two we had planned. Difficult to find staff to check in and check out. No signs indicating opening hours of the reception. Pitches well marked and hedged and level. Good value and pleasant restaurant in attached hotel. Sanitary facilities good, but hosed down at 8:00 in the morning just when we wanted to use them, so all floors wet. Bright security lights overhead within campsite. There is currently (May 2012) a block of flats being built next to campsite. We were not disturbed as it was Pentecost holiday, but could be disturbing during week. The camping is the courtyard/garden of a restaurant. No reception or watchman if the restaurant is closed (opening hours from 19:00). Excellent site for one or two night stopover to break up a long trip. Level pitches with very clean toilet/shower facilities. Close to shops and hotel/restaurant adjoining for food. Arrived in January and although the site was closed, our camper van was accomodated. Although there was no hot water as the site was closed, we had an electricity supply at minimal cost. Owner very pleasant and speaks English. Would you like to book Campsite De La Crau or request more information? You can do both using the information below. From Arles, head towards Salon-de-Provence. The campsite is signposted in the centre of St. Martin-de-Crau. CampingCard ACSI will send your information request to "Campsite De La Crau".